Located some 9 kilometers from the City of Kunming, Yunnan Nationalities Museum lies next to Yunnan Nationalities Village. More than 40,000 pieces of collections are well-preserved at the museum. Among them, the costumes of the ethnic minorities are the richest compared with other museums across China. Old books of the ethnic minorities, costumes of the ethnic minorities, folk fine arts, ethnic musical instruments, folk masks, folk ceramic art of the ethnic minorities and the like are on display at the museum. Yunnan Nationalities Museum offers 8 permanent exhibitions to admire at 11 galleries. 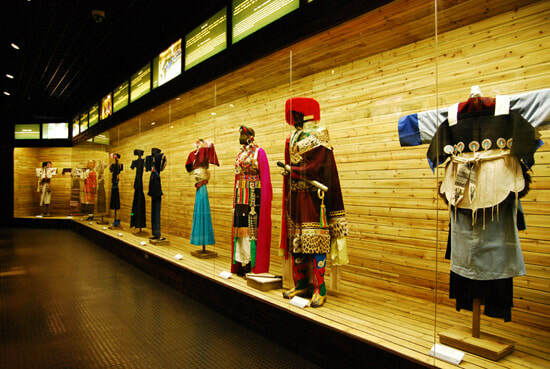 The exhibits including costumes, farm implements, folk art, and ancient documents of Yunnan ethnic minorities, vividly reflect the rich and colorful traditional culture of Yunnan ethnic minorities. At the museum, you will see the costumes of the 56 nationalities already named in China. On the first floor of the museum are Yunnan Ethnic Costumes and Textile Tools, Costumes Art of Chinese Ethnic Groups, and Ethnic Handicrafts Souvenir Shop. Halls of Folk Patterned Roof Tiles – Eave Caps, Traditional Daily Tools and Utensils, Folk Arts, Ethnic Musical Instruments and Precious Stones are on the second floor. In the exhibition hall of national costumes and production techniques, you can see the tie-dye craft of the Bai people, the batik of the Miao people, and art of the weaving of Zhuang brocade and Dai brocade, and a variety of embroidery methods. In the exhibition hall of folk masks, you will see masks of different expressions such as Tiaoshen masks, masks for sacrifices, theatrical masks, masks for driving the devils and ghosts out of the dwellings, etc. Some of the national instruments at the museum are less-known among the visitors. So is the means of playing the national instruments. The museum offers a great chance to get a little acquainted with the writing system of some ethnic minorities through the changing characters of them on display. Through the farm implements, you can also know about the distinctive styles of the architectures of the ethnic minorities, and everyday technology, such as oil extraction, sugar refinery, rice milling, paper making, and making ceramics. The best time to visit Yunnan Nationalities Museum is in the morning. As the museum lies next to Yunnan Nationalities Village, you could take a bus to the village first and then walk to the museum. Rent a vehicle to the village. This is the quickest and most direct option. Take Bus 44, 135, 165, 233, 24, 94, A9, 172, A1 and Bus 73 to the Stop of Yunnan Minzucun (云南民族村). Opening hours: 09:00 – 16:30 (Tuesday - Sunday). It is closed on Monday. As at 15th January 2019, the entrance pricing to the museum is free of charge. Please present your passport at the reception desk at the hall to get the entrance ticket. Interested in visiting the Yunnan Nationalities Museum on a Tour? Wendy Wei Tours offers a variety of different packaged tours as well as custom tours including the Yunnan Nationalities Museum, among other attractions and destinations. To find out more, please visit our Tours page or Contact Us directly to find out more.